What is often called “realistic paintings” are paintings that do not challenge the conventional sense of vision. There is nothing strange or unexpected: things are depicted exactly like we would have seen them ourselves in real life (“Like a photo”, — someone would comment, and mean it as a compliment). But we know that we don’t see reality as it really is. Our perception is limited by our senses, our place in the universe, our scale, our experiences, and a multitude of other factors. We know that Earth rotates around its sun, but our perception tells us daily that the sun rises, crosses the sky, and then sets in the evening. We know that Earth is round, but perceive it as flat most of the time. Whatever we know about its curvature, we still inhabit a rectangular Euclidean space (in painting, this perception is captured in the laws of linear perspective). As a young boy, Kuzma Petrov-Vodkin (1878 — 1939) had an experience that shattered this perception. One day, he fell onto the ground, and had a glimpse of unfamiliar visual impression. As he described it, he suddenly “saw Earth as a planet, and was embraced by unexpected, absolutely new sphericity”. It was still many decades before flying would become a common experience, and before the first astronauts would see Earth from outer space and bring back the pictures. And Petrov-Vodkin’s visual experience appears to have been very different from what we came to expect based on these pictures. It took him many years of studies — both from his contemporaries and from old masters — to develop a way of sharing this experience of space in painting, which he called “spheric perspective”. The spectator finds themselves within a strange, non-Euclidean, space, looking at the scene from high above and being very close to it at the same time. 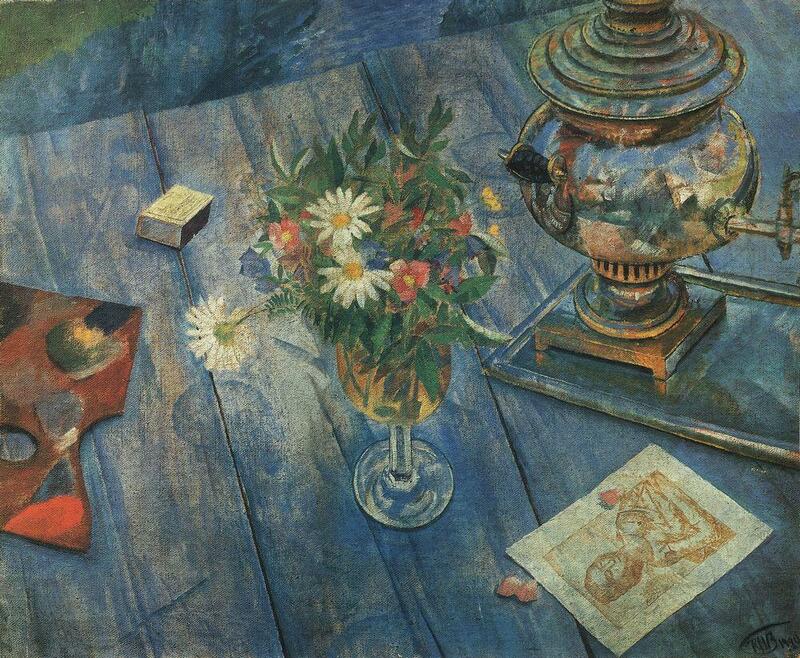 Kozma Petrov-Vodkin. Still life with samovar. 1920. The humble genre of still life may seem to occupy a very modest place in his overall body of work, but Petrov-Vodkin himself considered it one of the most vigorous modes of interaction between a painter and reality. It might have also been a shortcut to recreating the direct experience of spheric perspective at will: a still life set up is much easier to see from above, and from different vantage points (almost) at the same time, than any other kind of subject matter. He often filled his still life set-ups with reflective surfaces, both straight and round, which added to the non-Euclidean quality of his pictorial space. In this still life, the most conspicuous reflective surface is a samovar. Literally, samovar means “self-boiler” or “self-cooker” — an ingenious contraption designed to hold both hot coals and water (so as to keep tea hot for a long dinner-table conversation with family and friends). It seems tempting to get lost in the complex reflection of the sky and the surrounding landscape in the samovar’s curvy surface, but then we’ll miss another reflection: the painter himself reflected in the wooden surface of the table. This reflection is as it were hidden in plain view. All elements of the still life seem designed to point to it and to conceal it at the same time. The contour of his head rhymes with the curve of the palette on the left, and a stray chamomile bends down from its glass to look at this reflection in mutual tenderness. Once you notice this reflection, it may seem deceptively easy to reconstruct the overall scene: the artist is there just outside the painting, painting this very still life, including his own reflection in the table. He is simultaneously within the painting, as its inherent part — and outside, as its creator. But here is the rub: where exactly in this reconstruction should the artist be, in order to be reflected in the surface of the table like this? Contemplating this question leads us right into his original experience as a boy: being both high above the scene and very close to it, even within it, at the same time; lying on the ground, but seeing Earth as a planet. This seemingly simple still life can be seen as the quintessence of the artist’s relationship with their subject matter. The artist has to be both within their subject, as an experiencer, and outside it, as a witness and a creator. Lose the former, and there is no life in the work, no immediacy of experience; lose the latter, and there can be no mastery. If both are present, however, then the artist holds mirror up to nature, and is reflected in it in return, in an infinite dance of reflections within this non-Euclidean space.